Instead of dreaming in the mid-19th century that one end of a chain of six sp3-hybridized carbon atoms could join itself to the other, August Kekule had instead imagined that those same chains could add carbon atoms and join themselves in bunches to become one-dimensional threads, the course of organic chemistry may have been quite different than that described in your sophomore undergraduate textbook. As it happens, carbon chemistry needed to wait more than a century and a half before sp3 carbon nanothreads would be synthesized by the slow compression and decompression of benzene, as described by Fitzgibbons, et al. [Nature Mater. 14, 43-47 (2015)]. And just as Kekule’s chain of carbon atoms adopted a number of different conformations before joining into a ring, so too does the carbon nanothread have many potential structures. 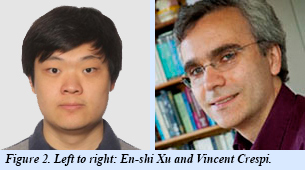 In new work from the EFree group at Penn State, graduate student En-shi Xu, along with University Partner Vincent Crespi and collaborator Paul Lammert, have been able to enumerate the possible distinct carbon nanothreads that can be formed by the one-dimensional stacking of benzene molecules in the solid state. The structural constraint applied to enumeration of the nanothreads is that each benzene ring must have six covalent bonds to next neighbor benzene rings in each direction along the length of the thread. The benzene molecules therefore act as “super atoms” with hexavalent bonding character, leading to a wide variety of connectivity patterns (Fig. 1). 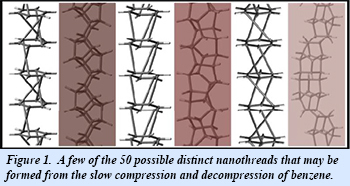 With a maximum of two benzene molecules per topological unit cell, a total of 50 distinct nanothreads is possible. The topological unit cell (the repeating unit of the nanothread) may differ from the traditional crystallographic unit cell as the result of non-translational symmetries or symmetry-breaking changes in the conformation of the chain of benzene molecules. Naming conformations devised for carbon nanothreads in this work are sufficiently generalized so as to be applicable to nanothreads formed from other molecules [E. Xu et al., Nano Lett. 15, 5124-5130 (2015)].